Eric is Founder and President of Sandhills Energy LLC. After graduating from Creighton University with a BS-BA in Finance in 2007, Eric joined Northwestern Mutual, where he had interned since 2005. In 2010 Eric established Johnson Capital Management, focusing on investment management and farm & ranch succession planning. Eric got his start in the renewable energy industry in 2010 helping to organize and establish Cherry County Wind Energy Association, the largest landowner association in the US, representing more than 50 landowners with over 450,000 acres. In 2012 Eric sold Johnson Capital Management and launched Sandhills Energy, becoming the wind energy developer for Cherry County Wind. Eric is highly engaged in promoting youth entrepreneurial growth, presenting regularly to schools and organizations across Nebraska. He is an active member of Connecting Young Nebraskans, serves as Board Director for Voices for Children, and is a member of the University of Nebraska President’s Advisory Council. Eric enjoys golf, woodworking & construction projects, and spending time with friends and family. Chuck Hassebrook spent 36 years on the staff of the Center for Rural Affairs, a national rural advocacy and development organization based in the Northeast Nebraska community of Lyons. He served 17 years as Executive Director. His work was crucial in securing the passage of state and federal policy reforms that strengthen family farms, small business, and rural communities. During his time at the Center, the organization provided loans, training, and business-planning assistance to over 10,000 small businesses in rural Nebraska. Chuck also served 18 years as a Regent for the University of Nebraska, including two terms as Chair. His efforts led to tuition assistance for students from modest income families and the creation of a Rural Futures Institute, aimed at revitalizing small communities. Chuck served on the Board of the USDA North Central Region Rural Development Center, the Nebraska Rural Development Commission, the USDA Commission on Small Farms, and the Board of Bread for the World, a Christian ecumenical anti-hunger organization based in Washington. In 2014, he was the Democratic nominee for Nebraska’s Governor. Chuck is a University of Nebraska graduate and native of Platte Center, where his family has farmed for more than a century. He lives with his wife, Kate, in Lyons, where they are active in Bethany Lutheran Church. They have two sons, Anton and Peter, both students at the University of Nebraska Lincoln. Michael joins SWE following six years serving the Western Arts Alliance (WAA), a non-profit membership organization supporting the performing arts in the western US & Canada. As Membership & Communications Manager for WAA he oversaw complete ground-up implementation of internal and public-facing database services for the Alliance’s more than 450 organizational members and several thousand industry contacts. Michael attended Bloomsburg University in Pennsylvania, where he was the first person in the University’s then 159 year history to graduate with all four highest academic achievements: Honors, Scholars, and Outstanding Graduating Major in English and in Philosophy. He has a Master of Arts in Liberal Studies from Reed College, Portland OR, and a Master of Arts ABD in Peace & Conflict Resolution from Hacettepe Üniversitesi, Ankara Turkey. His focus at Hacettepe, Environmental Peace, along with his thesis, The Animality of Peace: Environmental Action in the Collapse of the Carbon Age, led directly to his choosing a career in renewable energy. A native of Philadelphia, Michael has lived in Vienna Austria, Drumshanbo Ireland, Şile Turkey, and Portland Oregon. He makes his home in Cody Nebraska with his wife, Emily. 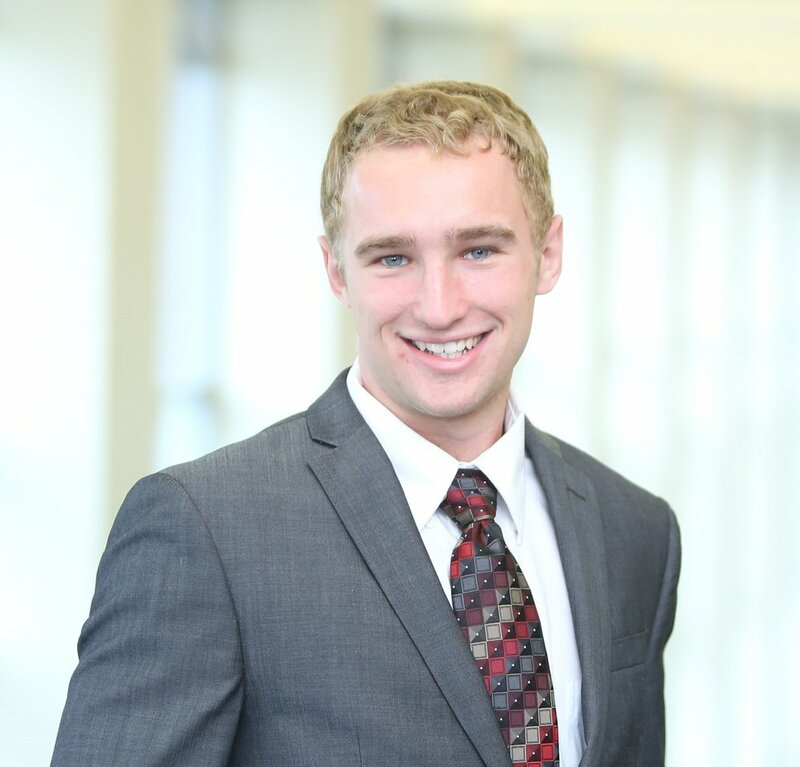 Brian is a 2018 Graduate of Creighton University with a degrees in Business Intelligence Analytics, and Marketing. Over the past 3 years Brian worked for The Business Ethics Alliance, as a programs coordinator and Kiewit Construction, within in the international tax division. Brian is also heavily involved within entrepreneurial development. During his time at Creighton, Brian founded a social entrepreneurship group and spent two years coordinating 3 Day Startup as well as working with incarcerated prison populations through Defy Ventures. Additionally, he spearheaded youth leadership development by coordinating Youth Leadership Omaha. In the summer of 2017, he spent three months traveling through Peru with a service immersion program. Brian enjoys reading, listening to podcasts, playing board games, and working on his blog about personal mission statements, which he recently gave a TED talk on.